The Human Rights Commission of Sri Lanka (HRCSL) has informed Navy Commander Vice Admiral Ravi Wijegunaratne to explain the allegation that he had threatened a reporter during a protest held in Hambantota on December 10, 2016. The HRCSL has informed the Navy Commander in this regard through a letter, it was reported. However, Wijegunaratne is currently on an official visit to India from 29 January to 02 February. 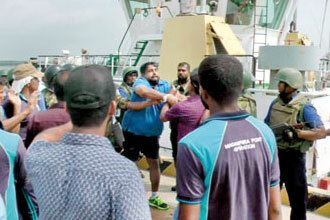 The incident happened at the southern port of Hambantota during a strike by port workers. Protesting employees of the Magampura Port were demanding that they be recruited by the Sri Lanka Ports Authority (SLPA) as the government was preparing to lease the loss-making port to a Chinese company. Sri Lanka navy personnel intervened and dispersed striking dock workers who had prevented a Japanese vessel from leaving Hambantota port. Footage later showed that Wijegunaratne was also present during the incident and he was also seen threatening one of the reporters covering the incident.